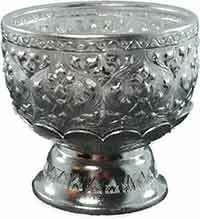 Thai Silver rice bowl comes in 2 pieces Holder and the cup. These are for individual servings. These pots are authentic rice serving pots used all over Thailand and in all Thai restaurants. Why not create your own Thai experience at home with these serving pots. The pots are made of patterned aluminum so they're very lightweight. Made in Thailand. These are for individual servings.